WEST WINDSOR – The presidents of Stockton University in Galloway Township and Mercer County Community College (MCCC) announced a new dual admission and transfer partnership Jan. 24 that will help students make a smooth transition from MCCC to Stockton’s bachelor’s degree program. The five-year Transfer Pathways agreement builds a strong relationship between Stockton and MCCC by offering multiple opportunities for students to seamlessly pursue associate and bachelor’s degrees at the two institutions of higher education. Stockton President Dr. Harvey Kesselman said the agreement will give students access to Stockton services while they attend Mercer County Community College. "We look forward to providing students with a smooth pathway to the more than 160 programs Stockton offers at its beautiful 1,600-acre campus in the Pinelands National Reserve and at our new beachfront campus in Atlantic City,” Kesselman said. Under the agreement, students who are denied direct admission to Stockton as a freshman can receive conditional dual admission in partnership with MCCC. Students will attend classes at MCCC, but have access to campus activities and student groups at Stockton and will receive a special Stockton identification card through the Transfer Pathways program. Students already enrolled at Mercer can also apply for dual admission to Stockton. Students who graduate from MCCC can automatically transfer to Stockton with junior standing to complete their bachelor’s degree. Application fees to Stockton will be waived for eligible students. 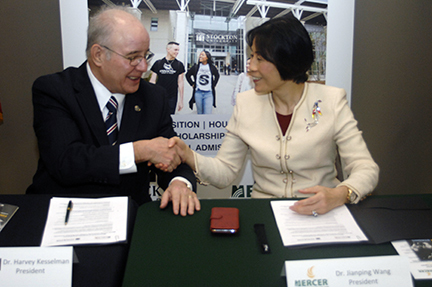 Dr. Harvey Kesselman, president of Stockton University, and Dr. Jianping Wang, president of Mercer County Community College, exchange documents and shake hands following the signing of a new dual admission program between the two institutions.